More post to come this winter: Please stay tuned. A blog to guide home gardeners with seasonal landscape improvements. Triton College Performing Arts Center, River Grove, IL. 60171. I highly recommend this conference if you are looking into incorporating native plants in your yard. Two great speakers are on the agenda. Read more below and click here for registration information. Additionally, U of I Extension will be hosting a table to promote the new Cook County Conservation@Home Yard Certification Program. 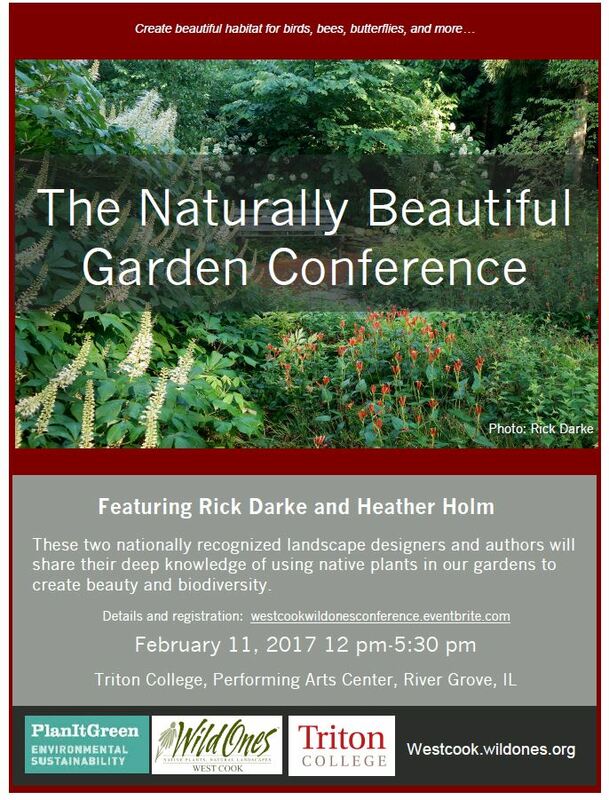 Rick Darke, an award-winning landscape architect and co-author with Doug Tallamy of The Living Landscape, will present his Putting Wildness to Work in the Living Landscape program in two parts. His work uses nature's layers in a landscape as a model for designed landscapes. He focuses on how all plants from the ground layer (forbs, grasses) to the middle layer (shrubs, understory trees) then to the canopy (large trees) all work together to create a beautiful, efficiently functioning ecosystem. Heather Holm, author of Pollinators of Native Plants, will present to us about how to consider native bees in our landscapes. Heather owns a Minnetonka-based landscape design and consulting firm specializing in pollinator landscapes and native landscape restorations. She is currently working with the University of Minnesota Extension faculty on a three year study to determine the types of native bees that visit cultivated blueberries in Minnesota. The study also includes developing customized forage plantings for the native bees identified, and providing additional or enhancing existing nesting sites within the farms. Heather is an environmental educator and frequent presenter at conferences in the Midwest and Northeast. She writes for Houzz, a social media website, about pollinators, beneficial insects and native plants. Heather is currently working on another book which will be released in 2017, stay tuned!